I have finally finished "Skippy" - so named because he's the colour of peanut butter and a "jumper" - a basic pullover. I 'll not bore you with the number of times I knit the end of the sleeves - from mid-forearm down - too short, too tight, too short still...it went on and on; but it fits! The neckline is garter stitch because I didn't start it early enough and therefore had no room for a ribbed finish. Knitting by the seat of your pants may free you from patterns; but not, human error. Anyway I have decided that one of my New Year's resolutions is - don't worry it has nothing to do with physical exercise - I am committed; but I'm not mad!!! - to bring a little - OK a lot - of discipline to my knitting. Please feel free to knit along with me, if you like. Here's what I plan to do. The book "Knitting in the Old Way" has been calling to me, so I decided to try to improve my knitting skills by knitting a few things (I am starting with a manageable goal) from it. I am also starting at the beginning with the Danish blouse. I have read the opening chapters of the book already - lots of things I didn't know were in there!! and I have done some web research on the Danish Nattrojer. As a result of my research, I have found that several other people have knit the blouse as well and written about it on their blogs. I can hear mother now, "You're not the first and won't be the last." and there was lots of raving about the blouse by Beth Brown-Reinsel in Interweave Knits - Winter 2004. The challenge here will be to stay true to the basics of the blouse but to add or change something to personalize it. After much thought, I have decided to use White DK Zephyr, which we have in stock now and to do the cropped version. I was going to use the patterns given in the book; but after some swatches - Oh yeah - those things - I have decided to keep it really simple and do a series of diamond seed stitch patterns to echo the seed stitch in the border and hope it works. This brings me to another area of thought for 2007 - personalized knitting. 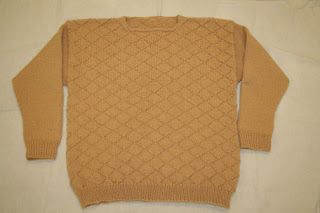 I hope to post pictures of knitted samples from our patterns - we have over 1,000 which have been knit and personalized in some way by "you, the knitter." Please send me pictures!!! I love the way patterns change with each knitter adding something of themselves to the project!! Well that should just about do it!! Notice I did not decide to work on more interesting meals, a cleaner house, better behaved children or a more organized office. No, 2007 will be all about - having fun!! !